Interview: Nikki from Where's the Frenchie? I follow Nikki’s personal Instagram for a while, I knew she is running a blog called Where’s the Frenchie which I love reading. She shares her life with a two French Bulldogs Weston and Fira, and a lovely and supporting husband John. As the name say Where’s the Frenchie you can imagine it will relate to travelling. Nikki travels with them all around the world, stays in different pet-friendly hotels and share their adventures and advice how to travel with your dog. She is such an inspiration if you ask me. Nikki built her life and business around the dogs that she is having. She build a job for herself and this is something I admire the most. Everything started just for fun when she only had one dog (Weston) with her Instagram account WTFrenchie, it moved into the blog and it took her completely new business SaintRue. Last month, I saw on her Instagram stories that she is travelling from Paris to London I send her a message. I asked her if she would have some free time to catch up and she invited me to Sanderson Hotel, where she was staying with her little family. I enjoyed this day so much and I am so grateful to Nikki that she said yes. That day something was taken from me and she gave it back. It was hope. Mina: Tell us a little bit about yourself, your background? Nikki: I was a makeup artist in Los Angeles for almost a decade and gradually changed career paths to commercial producing, catering and now creating content. Always something creative! Mina: Tell us a little bit about how did you started with your Instagram account @wtfrenchie, do you still remember your first 1k? Nikki: I think I probably have screenshots of when I first hit 1k, 10k and 100k! I only had Weston at the time (Fira wasn’t born yet!) and started the IG page because my coworker at the time had an IG for her cat. I thought it was kind of funny, so I started one and noticed so many other IG pages of french bulldogs. It was such a nice pick-me-up to see their smushy faces every day. I saw what a great community it was and started meeting fellow Frenchie owners. It really helped me with my social anxiety as well. Mina: That is such a good outcome. How long is since you started your blog Where's the Frenchie? Did you start Instagram first, or was the blog first? Nikki: I started the blog in January 2017 and @WTFrenchie IG four years ago. My husband and I travel with the pups a lot so I would get so many messages asking how to fly with a dog, which carrier bag is best and what paperwork is needed to travel. I love hotels, photography, design and of course frenchies, so it was a natural progression to start my travel blog wheresthefrenchie.com. Mina: You are on 118k+ now, what this means to you? Nikki: It’s exciting! I’m honoured to connect with so many sweet people and share Weston + Fira with them! Mina: What was the biggest thing you learned since you started your blog during this years? Nikki: Be consistent. It’s easy to fall into a rut and wonder if what you’re doing is even worth it. I think if it’s something you really enjoy and feel inspired by, just keep on your path but don’t put pressure on yourself. In everything in my life, if it doesn’t flow, I try to just let it go. Mina: This is a very good one. I am just learning about consistency and still have to learn a lot. 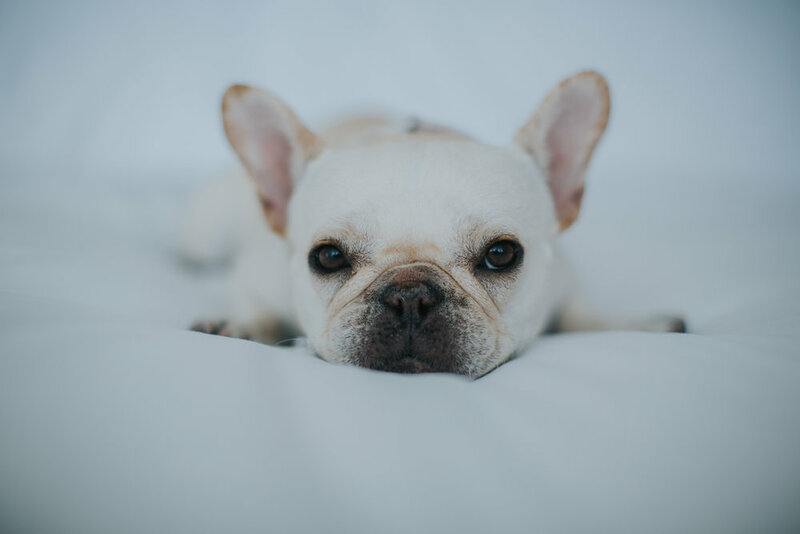 On your about page says you are a creative director for Where's the Frenchie, what was the biggest challenge that you had to deal with since you become a creative director? Nikki: Burning out. Sometimes you need a break to get that creative spark again. I try to do something fun (in real life) and get inspired by watching videos, travelling and reading about interesting people. Mina: Can you tell us a little bit about Weston and Fira? Nikki: Weston is almost 8 years old and Fira is 2.5 years old. Their personalities are so different! Weston is definitely the clown. He boops around wanting attention and wanting to play all the time. He has SO much energy---sometimes we joke that he’s not a french bulldog because all he wants to do is run and run all day. Now, Fira… she’s more a true frenchie. The only thing she loves more than sleep is food. She’s half the size of Weston, almost a permanent puppy. She just loves to cuddle next to you and be on a fluffy plush bed. Mina: What are you working on at the moment? Nikki: I’m so excited to be launching a new brand this year that I’ve been working on for almost a year. This company encompasses my love of design, true aesthetic and what I’m truly passionate about. Ever since I started my travel blog, I had dreams of one day having my own travel accessories line. SaintRue.com will be launching in September 2018! 20% of proceeds will be going to mental health organizations/suicide prevention groups and I’ll be able to shine a brighter light on these very current issues. Mina: This is wonderful Nikki, I am looking forward to seeing it. May I ask you, do you have an obsession? Nikki: So, I don’t even own one piece yet but I am in love with taxidermy. I am so curious about it and appreciate when it’s done beautifully---recently I saw an art piece of the head of a jackrabbit with little deer antlers on it. I would like to get Weston + Fira taxidermied when they eventually pass---morbid, I know. I find it so ethereal. Just trying to convince my husband first. Mina: Wow, that is very interesting. Well, good luck to explaing him. What was the last book you read? Nikki: Zag by Marty Neumeier. Mina: Would you recommend any books or authors to read to someone who just started their creative business, blog, etc.? Nikki: Marty Neumeier, Gary Vaynerchuk, Seth Godin, Girlboss by Sophia Amoruso, The Alchemist. Nikki: Green or fresh mint tea. I don’t drink coffee! Mina: What is the most interesting thing about you that we could not find in your CV? Nikki: When I was 16, I started my own underground hip-hop company including a t-shirt line and organized my first hip-hop event with performers, graffiti artists and more. I had no idea what I was doing and when I look back, I cringe. Lol. But I’ve always had that desire to be an entrepreneur and create something. Mina: What is your favourite social media platform? Mina: What are your top 5 Instagram accounts?